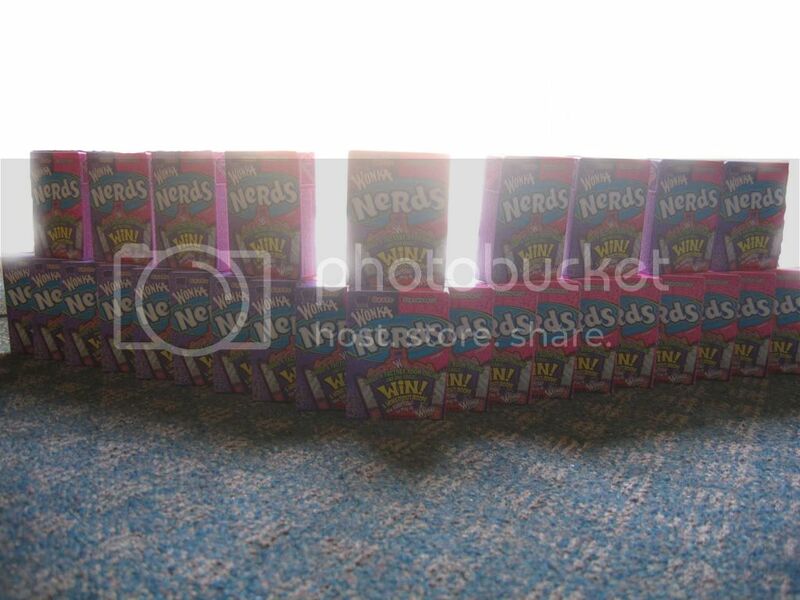 Seriously, I was in the Golden Bear Café this past Sunday (after the graduation ceremony of one of my best friends at Cal...*sniff*...), looked down and saw a box of Nerds. "Ooh!" I exclaimed as I picked up the entire box and carried it to the register. 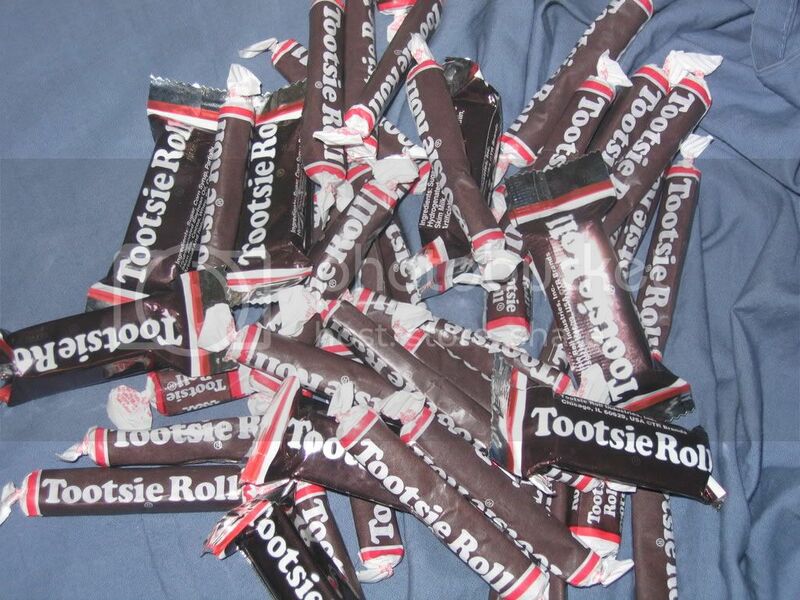 The world looks mighty good to me, 'cause Tootsie Rolls are all I see! My Boss: "Does anyone any candy out of this big bag?" Me: "We're not saving it for a later program?" My Boss: "No, I think we should probably just get a new bag for something like that." Me: "I'll take a look and see if there's anything I like...ooh, there's a Tootsie Roll!" Coworker: "Andrew, are you just fishing out all the Tootsie Rolls?" Me: "'Fishing' is such an ugly word. Let's just say I'm 'extracting' the delicious candies from this bag." Me: "Okay, here you go." Coworker: "Are there any Tootsie Rolls left in here?" Coworker: "Can I have a Tootsie Roll?" You can always tell the mark of a true watch-wearer. Elise (An RA at another unit): "Hey, Andrew! What are you doing at Unit 1?" Me: "Just passing through. It's a shortcut to CKC." Elise: "Well, while you're here, do you want to do some tie-dying?" Me: "No, thanks. I don't support hippie activities." Elise: "Hippie? 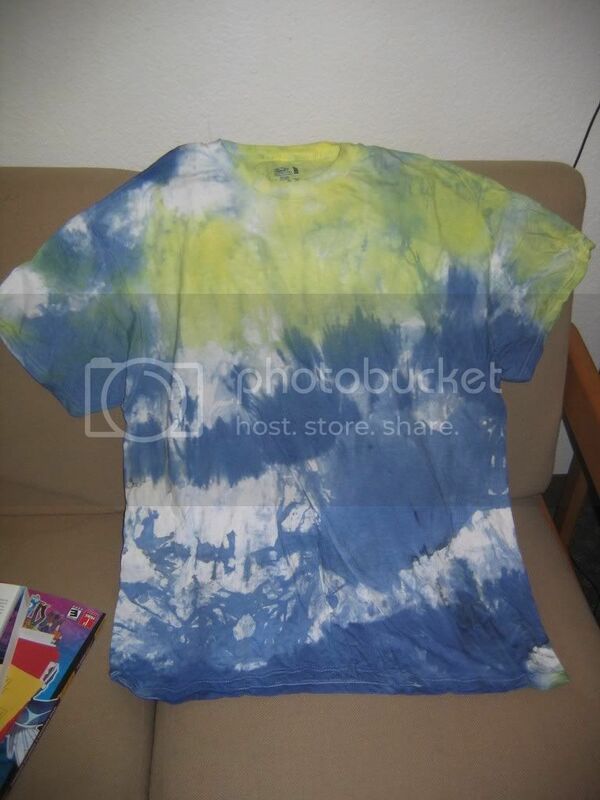 Tie-dying isn't exclusive to hippies." Me: "Yeah, tell that to everyone on Telegraph Avenue." Elise: "Wow, for someone who doesn't support 'hippie activities', you're sure getting into this." 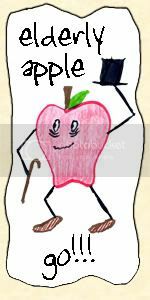 Elise: "Okay, now you unwrap it and...there! What do you think, Andrew?" Me: ".....It looks like a rainbow vomited." Does anyone else's thumb go back when fully extended? Seriously, I just noticed this, and it's bothering the hell out of me. I mean, that upper digits going back at like a 45-degree angle? 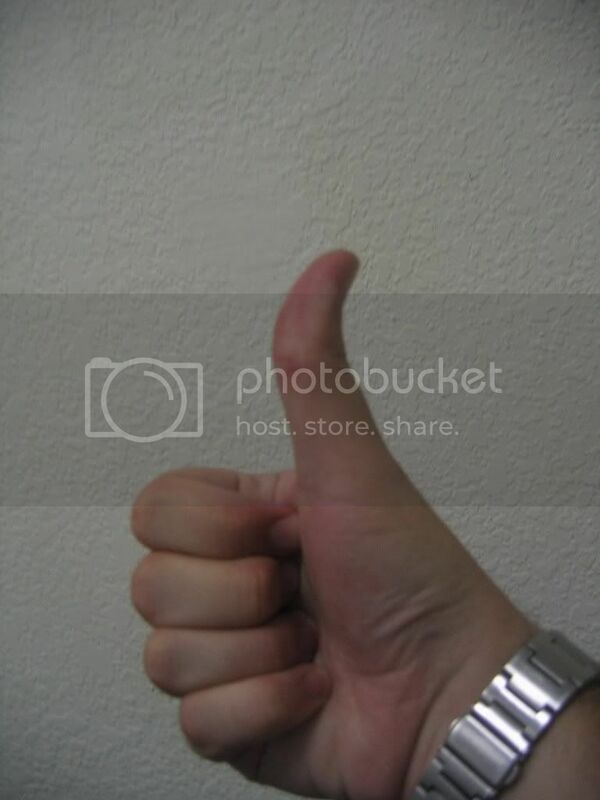 I haven't really looked at anybody's thumb closely enough, so I'm asking all of you to give yourself a thumbs-up, with your thumb fully extended. Is it strait, or does it lean back? I guess what I'm asking is...am I a freak (at least as far as thumbs go)? 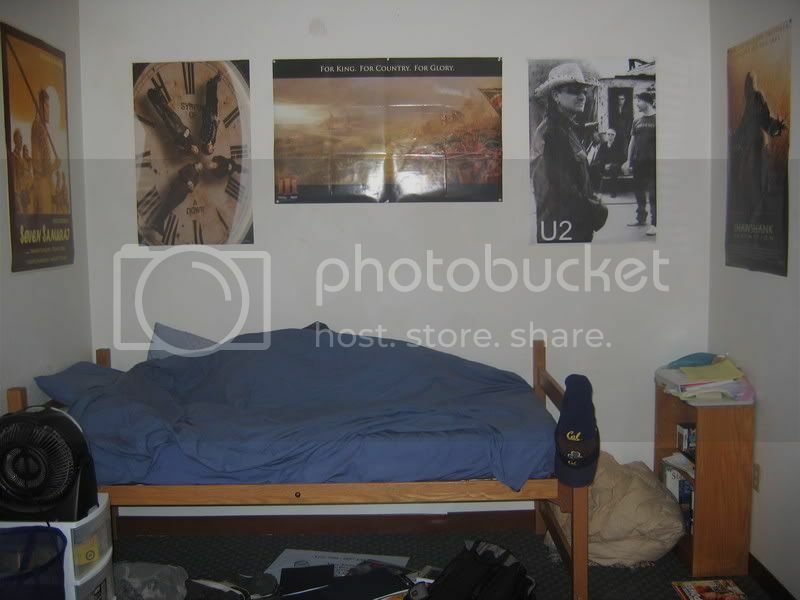 I'll probably say more about the (former) trappings later, but right now, all my posters and stuff are taken down. I've noticed that in the day and a half since, I have felt noticeably downtrodden. 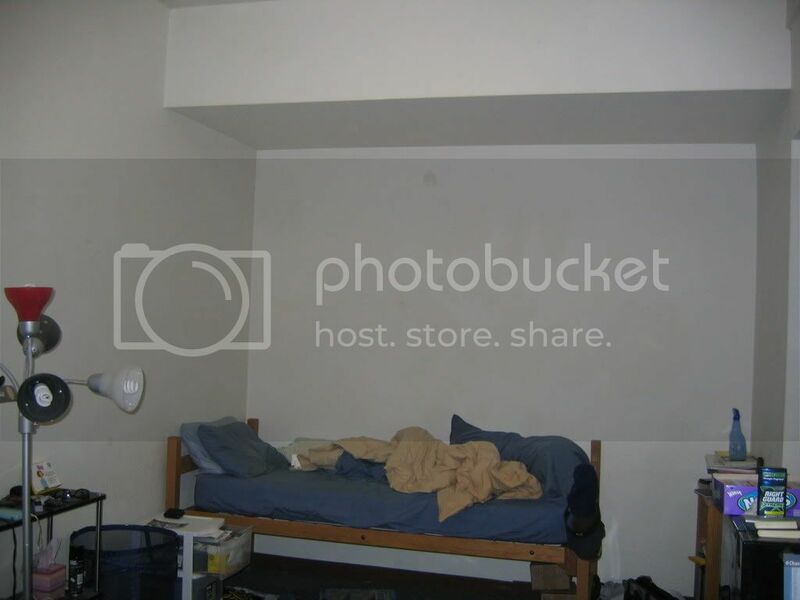 The room, it's just so big and...desolate. Amazing what posters can do (especially when you have lots of blank white walls). Okay, that's enough for today. I gots myself a final tomorrow, and I'm doing a lot of reading for it, even though it'll probably take less time to complete than I took to write this entry. My thumb goes back too, so I suppose if that's a unique trait, we're both thumb freaks. 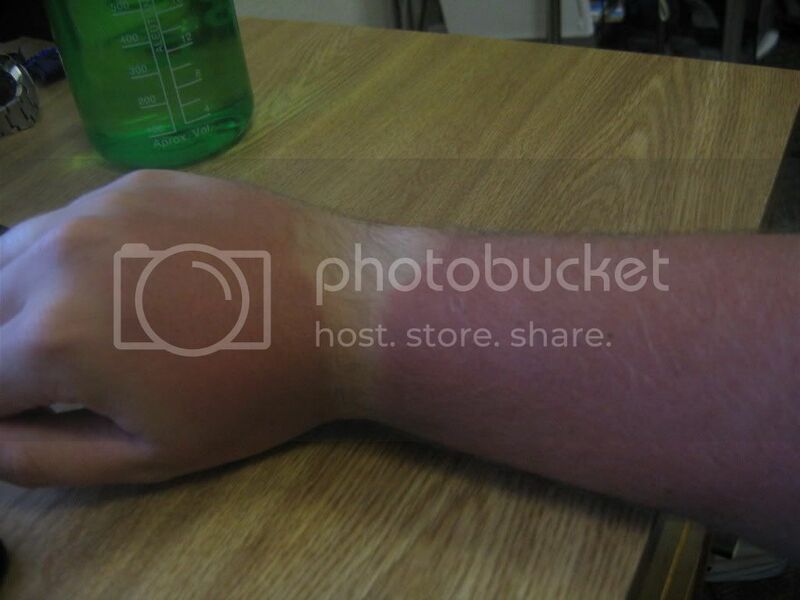 I remember having tan lines because of my watch... I stopped wearing it for a while, but it's back on now. Meh, my thumb does that too, but I guess if I can do it, it is an oddity of humanity. Your room, it's so clean. I'm disappointed, I had more faith in you. I guess we all gotta clean our act some time, though. My thumb doesn't do that, and I'm weirder than all of you...maybe i tie with Andrew-san...but still..Instead, i can wiggle my fingers and now one else ('side my mum) can do that, so nyah! I make them look like water...hehehe..okay, i'm done gloating now.